Defending innocent life at Franklin & Marshall College. With the renewed pro-abortion offensive and effort to remove all restrictions on abortion in as many states as possible, it has become obvious that the culture of death must be opposed with more vigor by all men of good will. On January 22, 2019 -- four days after the March for Life in Washington D.C. -- the New York legislature voted in favor of the “Reproductive Health Care Act” which allows abortion right up to the moment of birth. When the bill was approved, the chamber where the vote took place erupted in applause. The killing of the innocent received a standing ovation. Even worse, the unfaithful Catholic governor of New York, Democrat Andrew Cuomo, defended his approval for the new pro-abortion bill, declaring: “I'm not here to represent a religion. I'm here to represent all the people and the constitutional rights and limitations of all people, not as a Catholic.” The reference to "all the people" is political jargon, because some people -- the innocent preborn people deemed inconvenient -- are singled out to be killed. Another pro-abortion bill in the Virginia State Senate also attempted to allow procured abortion right up to the moment of birth -- and possibly even after birth. Only a few bishops have spoken to unequivocally condemn “Catholic” politicians who promote abortion. Among them are Bishop Joseph Strickland of Tyler, Texas and Bishop Richard Stika of Knoxville, Tennessee. Both prelates said they would have excommunicated New York Governor Andrew Cuomo if he lived in their dioceses. In light of these recent Culture of Death developments, TFP Student Action volunteers traveled to Franklin & Marshall College in Lancaster, Penn. on January 28 to campaign against the terrible sin of abortion. They met several deeply confused students on campus who called themselves Catholic yet insisted that abortion was permissible. Other students said, "Keep it up!" and "You're doing a good job!" Many more honked their car horns to show their support. 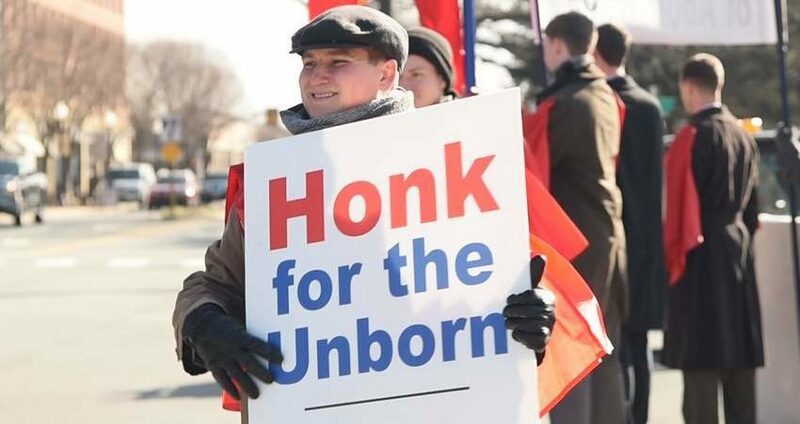 Most of the arguments for abortion hinged on the age-old slogan, “My Body, My Choice!” These were quickly refuted by TFP Student Action volunteers, who pointed out that the baby inside the mother is clearly a separate person. Other pro-abortion arguments stemmed from the fact that the murder-advocating women want to be able to behave promiscuously without consequence. When told that if they didn’t want to get pregnant, a foolproof way would be to abstain from sexual relations, they stared incredulously, aghast that one would even suggest such a thing. As we continue to fight for the fundamental right to life for the most innocent members of our society who are being slaughtered every day, please keep the TFP Student Action volunteers and our campaigns for moral values in your prayers.